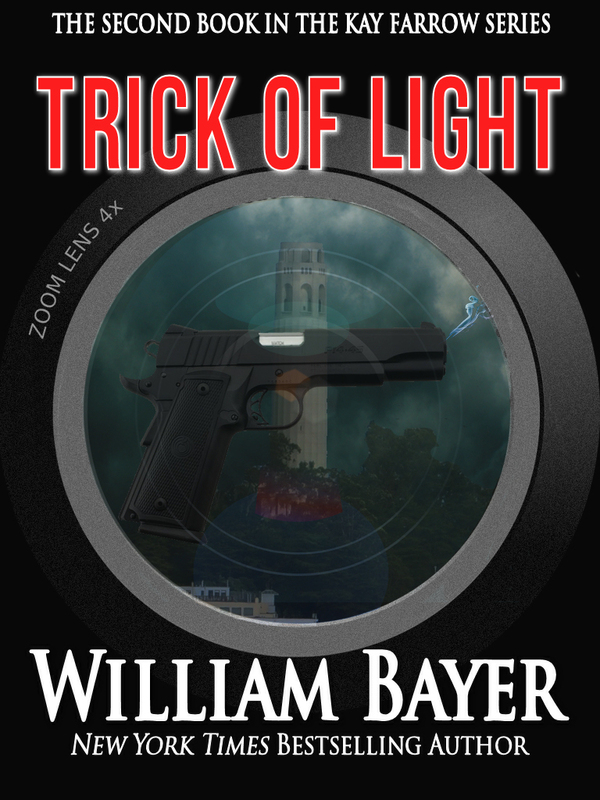 TRICK OF LIGHT is the second novel in the two-book Kay Farrow series — a shocking and provocative sequel to William Bayer’s national bestseller THE MAGICIAN’S TALE. Kay Farrow, the young color-blind photographer protagonist of the novel, sees the world in black, white and shades of gray. In TRICK OF LIGHT she probes the mysterious death of her beloved mentor, Maddy Yamada, on a quest that takes her to the darkest intersections of San Francisco’s Mission District. When distinguished photojournalist Maddy is struck by a motorcyclist at two in the morning in an area far from her Marina apartment, Kay Farrow’s grief is tempered by suspicion. What could have drawn the reclusive Maddy into such a seedy neighborhood at such an hour? Kay believes Maddy’s work-in-progress — blurry, abstract images, uncharacteristic of a woman famous for her unsparing clarity of vision — holds elusive clues. . .clues Kay is determined to decipher. Tracing old photographs and an undeveloped roll of film discovered in one of Maddy’s cameras, Kay begins to bring into focus Maddy’s activities at the time of her death. The territory Kay must cover runs from the back alleys of the Mission to the elite enclaves of Pacific Heights and beyond, to a very private shooting preserve miles north of the city. Lurking in her path is a netherworld of decadence and evil. . . and evidence that Maddy’s death was not an accident. Kay doggedly pursues a winding path to justice, negotiating a labyrinth of debauchery and dark desires that tops anything she encountered in the course of THE MAGICIAN’S TALE.